It was one year ago yesterday, February 27th, I had a biopsy to determine what type of cancer was renting space in my breast. And, tomorrow, February 29th…well technically, tomorrow doesn’t exist. Just like the cancer. 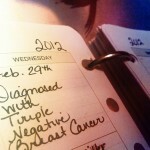 I was diagnosed with breast cancer on leap year/day. I find that God was in control even from the beginning. There is some debate within the cancer community as to what date is used to gauge survivorship. Is it the date you are diagnosed or the date you are cancer-free? There are as many opinions, beliefs and theories on when and why a survivor should use a certain date as there are websites containing this discussion. For some, they will choose the date of their diagnosis and others will choose the day they were cancer-free. Personally, I believe that you are a survivor from the moment you find out your diagnosis. Everyday you wake up is a day you won…you survived. I also choose to commemorate my cancer-free date, which is in about 4 months. I believe being a survivor and being cancer-free are two different things. Sadly, some will never be cancer-free, but they are no less of a survivor than anyone else diagnosed with this disease. Unfortunately, their survivorship was for a shorter period of time, but it is no less important. As I glance back and remember last year, I am filled with mixed emotions. I am angry for the family and friends that have gone through a cancer scare or have been diagnosed with some form of cancer this year. I am sad for the people I have met or known who have lost their lives this year after struggling and fighting so hard. I grieve for the young mother of two who had to fight emotionally, mentally, spiritually and physically to save her own life while her family sat by and helplessly watched, prayed and hoped their mom and wife would live to grow old and see them graduate, marry and have kids. And then I realize…I am that woman. So I cry for myself. And yet, I am so blessed. I feel fortunate to know, really understand, the delicate and precious nature of life. I feel loved by many family, friends and even strangers. But more so, that I am loved more than I can ever know by my Heavenly Father. I now know how much strength it takes to be weak, give up control and let God take over. My prayers have and will continue daily for you. Many people have been touched by your witness/blogging. You are a strong and amazing woman. Continue your good work helping others. May God bless you and your family. Congrats on your one year anniversary! I too am triple negative. Chemo done, bilateral mastectomy done. Radiation coming soon. Looking forward to being a survivor too! So glad the year is behind you and that you are moving forward. Your journey and how you have shared it so openly has given hope to so many hurting women! Life is very precious and needs to be lived as if everyday is our last, to many of us don’t do that. Even though it has been personally costly to you and your family you are giving a gift to so many. I am a TNBC survivor as well. I count my “survivor day” as the day I had surgery because at that point the tumor was out of my body. Congratulations on one year! I found your blog through a link on FB and I find we have much in common. Are there cancer twins because we might fit the definition! Triple negative? Check! 2 small kids? Check! Fear of recurrence? Big check! And my one-year anniversary of diagnosis is coming up on March 16. And like you, I am so thankful for every day. Thank you for your inspiring words. So blessed by your words as always! I am in awe of your survivor spirit! We are kicking cancers booty and like you I am grateful for every day.